How does a CD4 T cell activate a CD8 T cell? 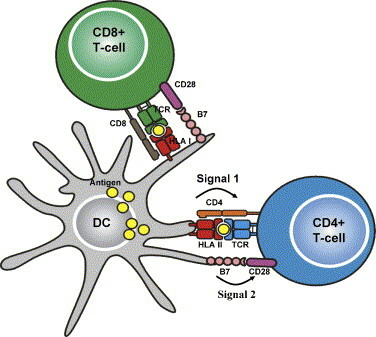 CD4 T cells activate CD8 T cells through an indirect process involving an antigen presenting cell (APC), normally a conventional dendritic cell (DC). An APC presents a peptide to a naive CD4 T cell via a Class II MHC molecule. The CD4 T cell becomes active and differentiates into a T helper 1 (Th1) cell through the release of IFN-gamma and IL-12, which are cytokines. The APC is now at a higher level of activation. It now begins to express more Class I MHC, B7, and accessory molecules such as 4-1BB. A peptide binds to the Class I MHC on the APC. A CD8 T cell comes along, and its TCR recognizes the peptide on this Class I MHC. The CD8 T cell now becomes activated by binding to the APC. Note that the two peptides mentioned had to have originally come from the same pathogen. This is an example of what's called linked recognition. To summarize, we eventually have a microenvironment in which the APC is bound to a CD4 T cell AND a CD8 T cell.